subroutine The Runner cannot break any subroutines on the next piece of ice he or she encounters during this run. 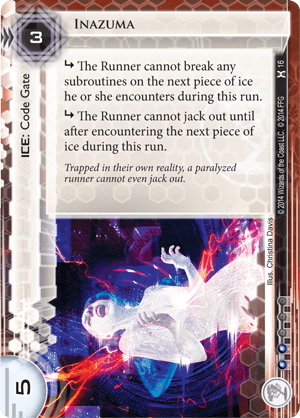 subroutine The Runner cannot jack out until after encountering the next piece of ice during this run. One of the defining archetypes of Jinteki ICE is what I think of as "positional" code gates. They've been around since the core set with Chum, but the ranks have been expanded with others like Marker and Sensei. What these programs all have in common is a very strong strength-to-rez ratio...but have subroutines which only function if they are installed as the second or later piece of ICE. This means that all positional ICE has a few weaknesses. The first weakness is that they eat up deck slots, but don't provide any real protection on the first turn. Seeing two Chum and no other ICE in your opening hand is a pain many Jinteki players know well. The second weakness is that, depending on their breakers, it may be easier for the runner to deal with the subroutines than to break them. Chum in front of Komainu is terrifying and a potential flatline...but, if the runner has a Mimic and enough credits to break Komainu, they can ignore the Chum entirely. Similarly, throwing a Marker in front of a barrier only really makes it one credit more taxing to break through with Corroder, so they won't likely spend three to break it with ZU.13 Key Master. And lastly, the weakness is that the runner can jack out if they aren't confident they can handle the next piece of ICE. Chum in front of a Cortex Lock is a nasty piece of work for a runner without a decoder...but any runner missing a breaker will bail out as soon as Chum fires, and come back later with their full rig. Inazuma is also a positional code gate; but among them, it is king. It still has the first weakness I mentioned, the first-turn unusability; but each of its subroutines directly addresses one of the other two problems, preventing the runner from jacking out or compensating with other breakers. If the runner hits Inazuma, they must try to break it...or they are hitting the next piece of ICE headfirst, powerless to stop it from tearing them apart. And at a 5 strength, 2-sub code gate, it's not cheap to get through, costing 5 to clear with Zu, or a Yog.0 and two Datasucker counters. But, the next piece of ICE is important. You need to be able to rez it or it doesn't do much good, so your economy needs to hold up to rezzing both piece of ICE at the same time. Ideally the follow-up should be more dangerous than just a normal Ice Wall (although a reliable ETR isn't a terrible choice either). Generally, you should avoid putting tracer ice behind Inazuma, because paying through a trace doesn't count as breaking a subroutine, and you aren't getting the best bang for your buck. Here are some of my personal favorie pieces of ICE to follow Inazuma with: Komainu, Viktor 1.0, Negotiator, Cell Portal (for the lulz), and the ever-popular Archer. And of course, you can always support a positional ICE game with Tenma Line, Sunset, and Midori, although this is typically more trouble than it's worth. As a supplement to the previous review by @tiedyedvortex: I usually see Inazuma in Bioroid decks - and I hate it every time. "Here, meet Heimdall/Ichi/Viktor... Have fun." On the other hand, Inazuma is in fact an ICE that requires BOTH of it's subroutines to fire to be really scary. Single D4v1d counter or Grappling Hook can dismantle the whole contraption (by allowing to escape the trap or to interact with it). One more thing - Inazuma's second subroutine does not require another piece of ICE to be actually there - the Runner still cannot jack out. "Here, meet my Junebug/Cerebral/Aggressive Secretary... Or welcome to my booby trapped Archives!"